If you are looking for a relaxing getaway, this Rye Key house is the place for you. Located in Cedar Key, Rye Key is a small gated community of fewer than 15 houses. Our house offers the ultimate in quiet and privacy. It is located on a short street with only two other houses and on a lagoon shared with only one other house. Although every room has many windows, curtains seem unnecessary for privacy. This quiet privacy is only two miles from the historic commercial area of Cedar Key, easily reached by car, golf car or bicycle. The light-filled, tile-floored house features two bedrooms separated by a great room. Each bedroom has a queen size bed, bathroom, sliding glass doors and a small covered porch. The great room has a living area with leather furniture, a dining area and a sun porch with a wall of floor to ceiling windows overlooking the water. The fully equipped kitchen is separated from the great room by a bar with stools. There are porches on both the land and water sides of the great room. A private dock allows access to the water. Fish for red fish, kayak, canoe or simply sit and watch the tide change. The lagoon is home to many varieties of birds, including herons, egrets and osprey. Mullet jump, catfish and stingrays swim in the shallows, the big red fish feeds on the oyster bars and, occasionally, a dolphin visits. Newer range with flat top cooking. Nice property. Enjoyed our stay. Lots of stairs...not handicapped accessible. Very peaceful, quiet and scenic! Not too far from town center. Was as pictured. Two bedrooms on either side of the house - good for privacy. Beautiful views to die for! Very quiet and peaceful. The dock was nice. Beautiful at night with lots of stars. Would return for sure. The kitchen was not very well stocked for cooking so that is why 4 stars. Great Place! Wife Loved It!!!!! My wife and I really enjoyed our 3 day stay and plan on going back. The house had everything you needed. The view from the row of windows was great and every day we saw some different kind of bird. Enjoyed the sites in Cedar Key and we were very relaxed and comfortable at the house. Beautiful home in a beautiful natural setting! My husband, daughter and I had a wonderful week at Heron House. The location is removed from the busy part of town and we loved that! The home itself is very comfortable. Everything was very clean and comfortable and worked properly. We enjoyed fishing off of the dock and I personally loved it even more when the tide was out. I could sit and watch the egrets, herons and pink spoonbills all day! The kitchen is stocked well with pots, pans and dishes. There are plenty of towels and hand towels. We did bring some beach towels which they didn't have. If you like to cook like I do, the in town market has some things, however, we stopped at the Walmart supercenter in Chiefland before we got to the house. The beach in town is small but very nice, we rented kayaks twice right off the beach and the second time kayaked with about a dozen dolphin. My husband and daughter did a fishing charter with Cedar Key Outfitters which they really enjoyed. I drove to Williston to go to Two Tails Ranch Elephant rescue. Beyond wonderful!! We dove at Ginnie Springs and kayaked and snorkeled at Three Sisters. We loved Cedar Key and beautiful Heron House! We spent 2 nights here recently and loved it. 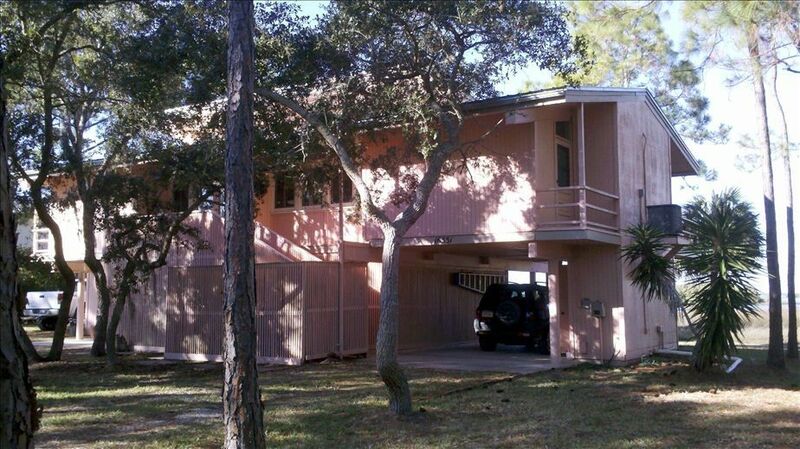 The location is very quiet and private yet not too far away from the main town of Cedar Key. When I walked into the house for the first time I was smiling so much because of the view out of the wall of windows. Looking out at the water was just so peaceful. The house was very clean and had everything we needed. The outside of the house could do with some refreshing, but overall was great. We went kayaking, walked around town and ate out at a local restaurant as well as just spent some quiet, relaxing time at the house. The dock was fun to have and it was enjoyable going out there to check things out when the tide changed. We would love to come back here again next trip to Cedar Key. Great place, nice getaway. Only problem was the living room/dining area air conditioner wasn't working by the 2nd day of our stay. Rates are subject to change until confirmed. Please leave the home as you found it with all furniture put in place. Any small damage needs to be reported to mgmt. Any large items damaged and not reported will be charged to you. Pets must be on a leash at all time when outside. Please be courteous to your neighbors and care for our home as you would yours. Thank you.